What would Susan B. Anthony and her fellow suffragettes think if they knew that close to 40 percent of unmarried women weren’t even registered to vote at the start of the last presidential election? On August 18, 1920, a state legislator from Tennessee cast the deciding vote to ratify the 19th Amendment. More than 144 years after the founding of the United States, and 14 years after the death of Susan B. Anthony, one of the suffrage movement’s most passionate and relentless leaders, American women had the right to vote—and they did. Eight million women turned out in November 1920 to exercise their franchise for the first time and assert their rights as equal citizens in our democracy. Today, we are failing to live up to their legacy. What would Anthony and her fellow suffragettes think if they knew that close to 40 percent of unmarried women weren’t even registered to vote at the start of the last presidential election? I think they would be more than disappointed. I think they’d be livid. As the 2016 election nears, I’m concerned that unmarried women may once again squander an opportunity to improve their lives by failing to vote. If you’re one of the 56.8 million unmarried women in America today, you have the power to change election outcomes—from the Presidency on down—if you simply show up on Election Day in 2016. Next year, for the first time in history, a majority of women voters are projected to be unmarried. This is a demographic with almost unprecedented power over the outcome of elections, yet recent polls show that they’re throwing that power away. Why aren’t unmarried women stepping up to elect officials who support policies that benefit them? Do they need to be reminded of what Anthony once said, “There never will be complete equality until women themselves help to make laws and elect lawmakers”? On Election Day in 1872, Anthony showed the courage to vote for President of the United States—illegally. She was later arrested, tried, and found guilty for doing so. She was fined $100, but refused to pay it or apologize for exercising a right that she fundamentally believed in, but did not have. This isn’t an argument for voting illegally—but really, where is this level of moxie and desire to participate in our democracy from single women today? Single mothers are one of the most economically vulnerable groups in the nation, and many unmarried women are concerned about their economic well-being. And they’re right: They make a mere 61 cents for every man’s dollar. And, of the 3.3 million Americans earning at or below the minimum wage, 48.7% are unmarried women. Anthony, who never married, once said, “I think the girl who is able to earn her own living and pay her own way should be as happy as anybody on earth. The sense of independence and security is very sweet.” In today’s world, however, the financial security many unmarried women have is not so sweet. Unequal pay for equal work reduces a woman’s ability to buy a home, provide for a family, or save for retirement at the same rate as a male counterpart. Yet, single women have not shown up at the polls on Election Day to elect leaders who support the policies that would have a real impact on their daily lives and futures. 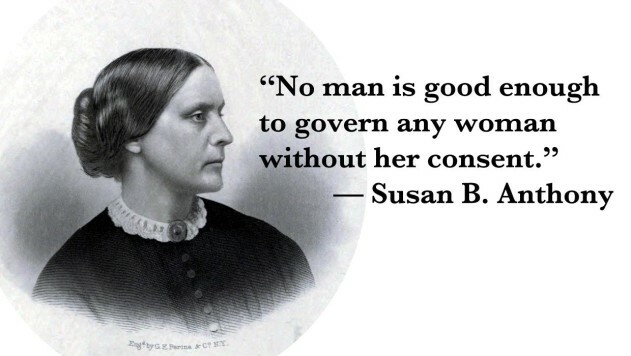 In honor of the 95th anniversary of women getting the right to vote, I encourage you to channel your inner Susan B. Anthony and upset the status quo. Be an active participant in our democracy and go get registered to vote. Only through exercising this right will our nation’s policies accurately reflect who America is today. Page Gardner is the Founder and President of the Voter Participation Center. She is an expert in the voting patterns of women voters and has dedicated her career to increasing the civic engagement of unmarried women and other historically underrepresented groups in our democracy.